Here, we'll focus on the pump — specifically, how certain aspects of the pump performance curves can lead to variations in flow at reduced speeds — because this requires the expertise of people in the process group, not the electrical department. 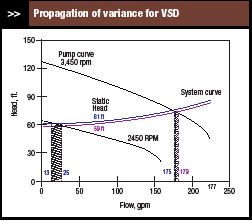 Most electrical departments can provide a good analysis of the VFD but aren't familiar with pump performance curves. A control valve also is required in the line to the process to provide appropriate flow. In some configurations, this flow loop is the inner loop for a level-to-flow cascade, a temperature-to-flow cascade or other cascade arrangement. 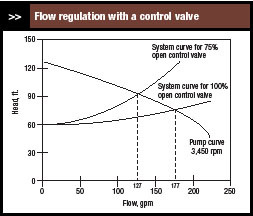 In some cases, the flow isn't measured; instead the output of the level, temperature or other controller is connected directly to the control valve. Often some modifications are made to reduce costs. We'll assume a flow controller here, but the points generally apply to all configurations. In contrast, with a variable frequency drive a flow measurement is used to adjust a speed or torque controller included with the VFD electronics. Manufacturers always stress possible energy savings with a variable frequency drive. However, especially in industries such as specialty chemicals, few VFDs are large enough to provide sufficient energy savings to justify their additional cost. The controller for pump flow also is eliminated but this component is likely to be in the software of the digital controls and therefore "free." The above only considers normal process operations. The minimum flow for the variable frequency drive will be lower than that for the constant speed VFD but won't be zero. There are always startup issues to be addressed and usually other considerations. For example, it may be important to prevent fluid backflows through the pump. If positive shutoff is required, the control valve in the line to the process must be replaced by a block valve. Nevertheless, eliminating even a single item of equipment, particularly one that would be made of stainless steel or other expensive material, may easily offset the additional variable frequency drive cost. And these savings come upfront, which appeals to project managers. A variable frequency drive also can provide maintenance savings. Control valves are high upkeep items, and handling corrosive and toxic fluids makes matters worse. Just replacing a control valve with a block valve reduces maintenance costs. From a control perspective, a variable frequency drive has another distinct advantage — it doesn't exhibit stiction, hysteresis and other mechanical issues posed by a control valve. Today's VFDs incorporate either speed control or torque control, thus providing the counterpart to the positioner advocated by control engineers for control valves. Pump performance curve (or just "pump curve"). 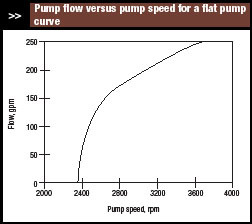 This curve, provided by the pump manufacturer, relates pump flow, pump head and pump speed. Friction head. As flow increases, pressure drop due to the fluid's resistance to flow increases by approximately the square of the flow. All components in the flow system contribute to friction head. 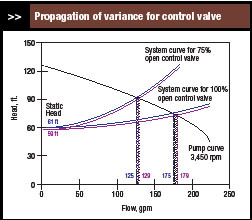 Closing the control valve doesn't significantly affect the propagation of variance from head to flow. But as we shall see, this isn't necessarily the case for VFD controlled pumps. 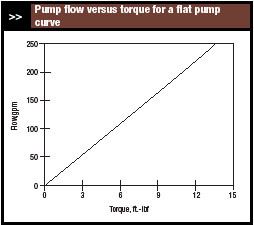 Flow decreases in proportion to the pump speed; head decreases in proportion to the square of the pump speed. The affinity laws also state that power decreases with the cube of the pump speed, which strengthens the energy savings arguments by variable frequency drive manufacturers. For our example, NC is 3,450 rpm, HS is 60 ft., and HC0 is 127 ft. The minimum pump speed is 2,370 rpm. So, the variable frequency drive must operate over the range of 2,370 rpm to 3,450 rpm. The minimum speed is 69% of the maximum speed; the turndown ratio is 1.46:1. variable frequency drives are easily capable of this. Even with this increase in variance, the pump probably would still perform satisfactorily. 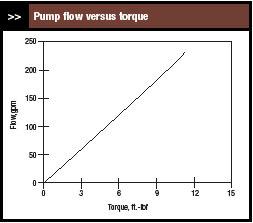 At low flows, the pump curve in Figure 4 exhibits a significant sensitivity of head to flow. This isn't the case for all pumps. For some, the pump curve at low flows is essentially flat (slope is zero) — that is, at low flows, pump head is independent of flow. For such pump curves, the propagation of variance from static head to pump flow would be much larger. 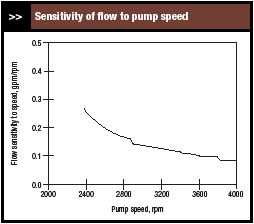 Pumps with a flat pump curve at low flows likely will experience cycling between no flow and some positive flow. Avoid them if you want a variable frequency drive to perform smoothly at low flows. Pumps with pump curves such as in Figure 6 probably wouldn't exhibit the cycling. It's also important to understand the change in flow produced by a given change in pump speed. While techniques such as scheduled tuning could address this problem, conservative tuning usually can accommodate a change in sensitivity of 3:1. But it's possible that the change in sensitivity could far exceed 3:1. At low flows, the pump curve in our example exhibits a significant sensitivity of head to flow. However, the pump curve for some pumps is basically flat. For such pumps, the increase in sensitivity would be much larger than 3:1 and could even lead to instabilities in the loop that outputs to the pump speed. 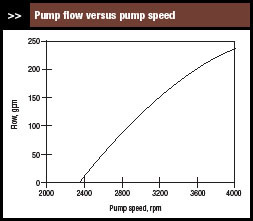 Pump curves traditionally are drawn with pump speed as a parameter. This might imply that the flow through the pump is best controlled by varying the pump speed, but it isn't necessarily the case. Changing the torque may make more sense. 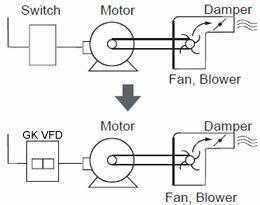 variable frequency drives can control either of these variables. 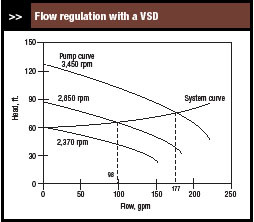 When the input signal to the VFD electronics adjusts pump speed, the relationship between flow through the pump and pump speed is important. This can be computed from the pump curve and system curve (Figure 6). The departure from linearity is noticeable — and is consistent with the changes in the sensitivity of flow to speed (Figure 5). When the input signal to the VFD electronics adjusts torque, the relationship between flow through the pump and torque is important. This also can be computed from the pump curve and system curve (Figure 7). The graph exhibits only a slight departure from linearity, making it preferable for PID control as that control equation is linear. 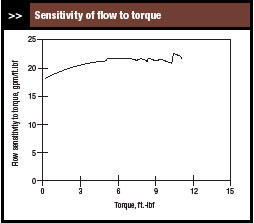 So, for a centrifugal pump with a variable frequency drive it's usually preferable to use torque to control flow. This also seems consistent with the future directions for variable frequency drive technology.